Bitcoin’s (BTC) price surpassed 7,000 early Tuesday after 20 days in a narrow range below 6,800. The worlds largest cryptocurrency by market capitalization first moved past the 7,000 mark early Tuesday after trading sideways for the past 20 days. Bitcoin passing the psychological hurdle did not come without warning. As mentioned last week, bearish bitcoin futures bets had hit a record low signaling investor sentiment was beginning to shift into bullish mode. What’s more, the market was not phased by the SEC’s decision to reject several ETF proposals last week. While negative, the news failed to wreak havoc on prices, as has happened previously, and was a sign that bearish market pressure was reaching exhaustion. 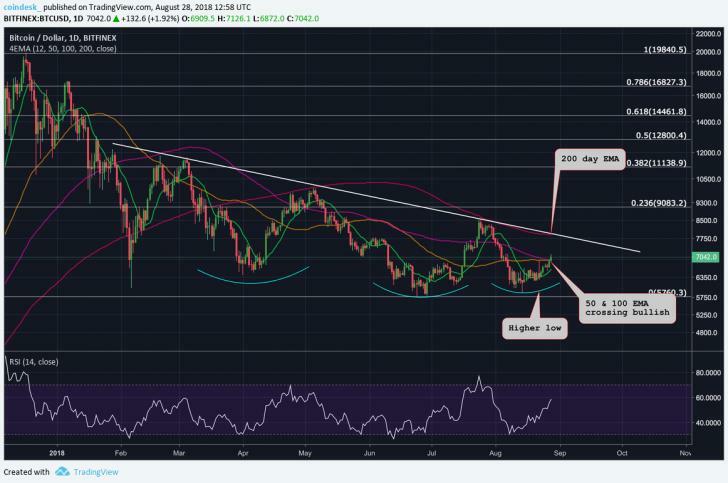 After closing a 4-hour session above the elusive resistance zone at 6,700 – 6,850, the Bulls continued to ultimately pass the peak of the prior rally to 6,899 seen on 22 August. The next level of resistance currently resides at 7,165. What’s more, the price was able to close above the 200-Day EMA a feat not accomplished since 4 August. Finding acceptance above all of the short-term EMAs signals the path of least resistance is to the upside, at least in the short-term. 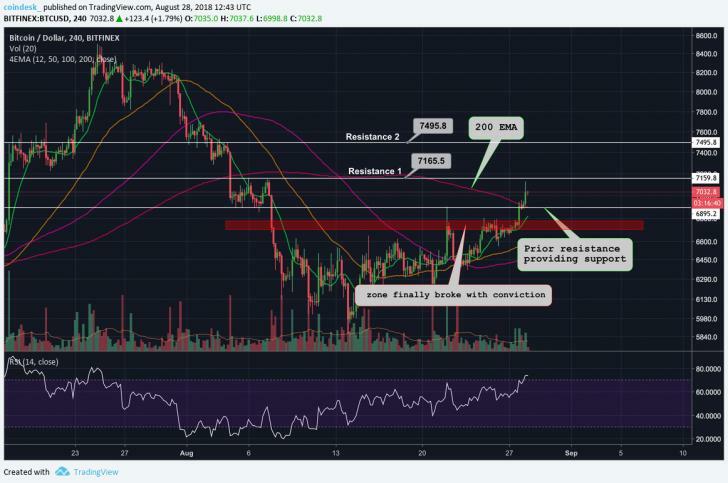 A short-term pullback to prior resistance at 6,899 would be considered healthy, as price often falls back to prior resistance in order to prove it can hold as support. The daily depicts a couple of Bullish indications that suggest a move to around 7,600 is more than possible. Bitcoin is defending its 1st higher low on the daily time-frame since April a strong Bullish indication since the Bulls were able to defend avoid setting a new low for the year. And, the 50 and 100-Day EMAs are forming a Bull cross, signaling that momentum is indeed shifting away from the bears. The strongest resistance on the daily timeframe lies near 7,800 the location of the 200-Day EMA and descending trendline resistance. Longer term, Bitcoin setting a higher low is a Bullish sign that could fuel a move towards the 200-Day EMA at 7,800. Finding acceptance below prior resistance at 6,550 would negate the short-term Bullish view.